Dandy Nails Look Around & Come Out and Play Explosion! I know I said I was going to post this in the morning but I was too excited for it, I just couldn't wait! I have already posted both of these polishes and they happen to be my two favorite Dandy Nails - Look Around and Come Out and Play. I used this tutorial from Nailside (whom I LOVE) and it was fairly easy. I messed up on two of the nails and had to fix them but it wasn't a big deal. 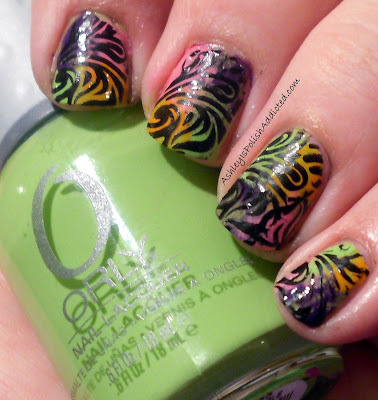 I absolutely LOVE this mani!!! What do you think of my Dandy Nails expolsion? Dandy Nails will be releasing four BRAND NEW shades tomorrow and you can see them in two different posts from two of my favorite bloggers - Pointless Cafe and I'm Feeling Nail-Venturous. They are amazing, you don't want to miss them! 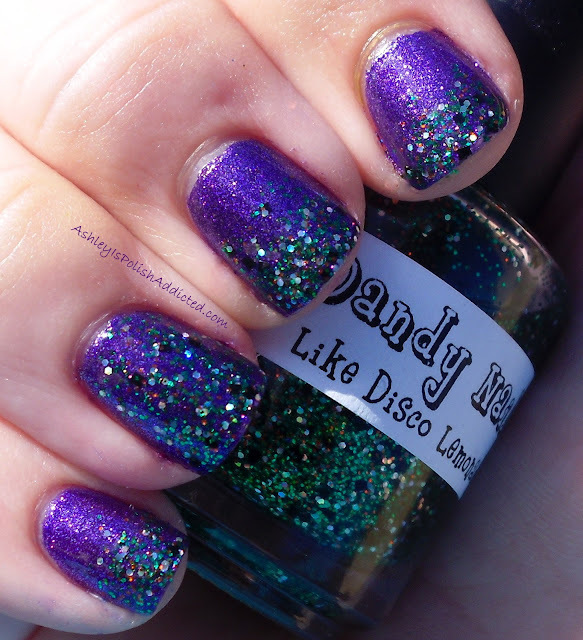 Dandy Nails is restocking tomorrow (August 1st) and to celebrate I have TWO Dandy Nails posts. One tonight and one in the morning! The one for tomorrow is my favorite but I love them both. For this mani I used Like Disco Lemonade over Catrice Forget-Me-Not (I will have a post on that soon) which is a warm-toned deep purple foil. I applied it as a gradient on all fingers except for my ring finger, where I did a full nail accent. I hope you enjoyed this mani! 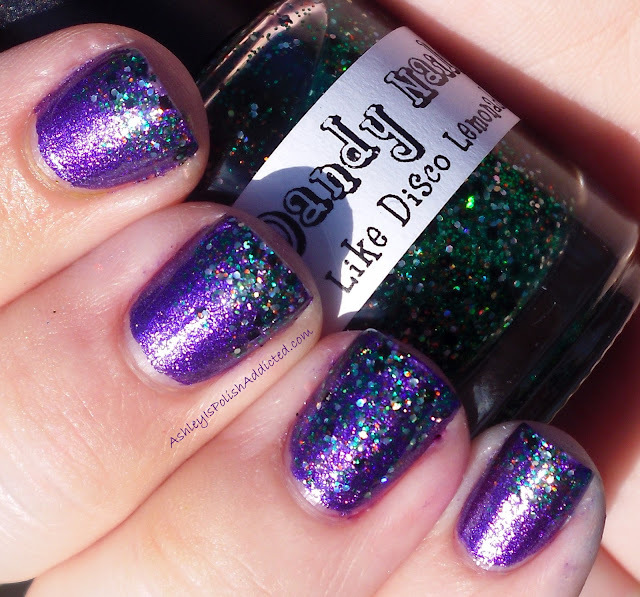 Make sure to follow Dandy Nails on Facebook for info on the restock time and stock! You can go directly to her Etsy shop here. She will be releasing four BRAND NEW shades tomorrow and you can see them in two different posts from two of my favorite bloggers - Pointless Cafe and I'm Feeling Nail-Venturous. They are amazing, you don't want to miss them! Of course after receiving this I just had to get one of my new pretties on my nails ASAP. And what better to start with than the AMAZING Dior Jamaican Pepper!? I had been wanting this one for awhile but hadn't been able to get it, it was so sweet of her to think of me. The formula on Jamaican Pepper was nothing short of perfection. And it has all of the normal Dior goodness - the amazing brush...the secret shimmer...*sigh* I did top it with the Dior Top Coat, which was also amazing. I did wait quite awhile before applying it because I didn't want to turn the top coat pink. Been there, done that. It was partly cloudy today (yay!) so I had an interesting time taking pictures. I'm sure my neighbors think I am nuts by now, but that's nothing new. LOL So some of these are sun pics and some are "shade" pics. I am back for the second time today. I was going to save this post for tomorrow but I had some extra time on my hands and was excited to share so here it is. 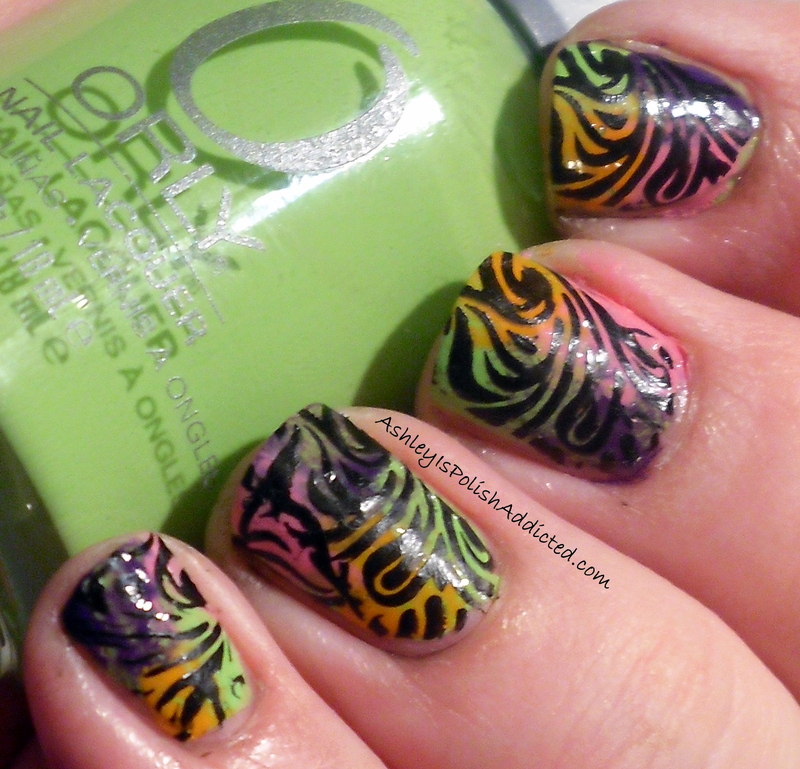 All of the colors I used are from the Zoya Designers Collection. I was really craving the cremes BUT I think it might have looked a little better if I had included a shimmer in the design. I think I should have used Suri from the Divas Collection instead of Monica for the purple. Oh well, hindsight is 20/20, right? What do you think of this design? I think it's okay but could use improvement. I hope I can eventually perfect this design, I really like it. The Designers Collection is available for purchase now at zoya.com for $8 each. Zoya is an amazing company that runs sales and promotions very often. Make sure to catch those by following them on Facebook and Twitter. Zoya is 5-Free and Cruelty-Free AND makes amazing polish! What more could you ask for? I hope you all are enjoying Zoya Week! I have my first "nail art" post of the week and I think it turned out pretty cute! It reminds me a little of raindrops, which I happen to love and don't get to see nearly often enough. For this mani I used polishes from the Zoya Divas Collection for my base colors and polishes from the Zoya Designers Collection for my dots or "raindrops." After applying the base colors I topped them with a matte top coat (which Zoya REALLY needs to make) and then applied the dots with dotting tools. What do you think of my "Raindrop Doticure?" I think it's pretty fun and it was super simple! The Designers and Divas Collections are available for purchase now at zoya.com for $8 each. Zoya is an amazing company that runs sales and promotions very often. Make sure to catch those by following them on Facebook and Twitter. Zoya is 5-Free and Cruelty-Free AND makes amazing polish! What more could you ask for? 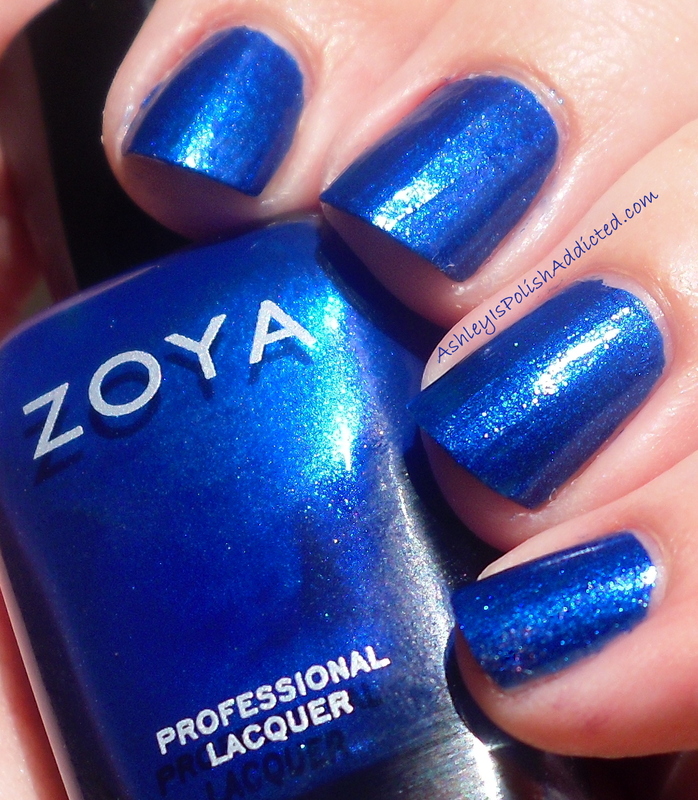 Are you ready for the last of my Zoya swatches? The rest of the week will be dedicated to nail art and combos with these polishes. I am excited for that! But up first are swatches of the Divas Collection. This is the shimmery, in-your-face part of the collection and each and every one of them is gorgeous. Okay, now to get the formalities out of the way. Song, Elisa, Suri and Ray all have similar finishes and formula. They are shimmers that had easy application in 2 coats (some could have even *possibly* been one) and no issues with formula. FeiFei and Daul are different than the other four. They are sparkly goodness in a bottle. I chose to show you these on their own for now but they are on the sheer side and because of this make AMAZING toppers. I used 3 coats of Daul in the pics. You will see VNL in the sun (as in the pics) but I could not see it inside under artificial light. FeiFei is more opaque than Daul. I used 3 coats on my index and ring fingers and 2 coats on my ring finger and pinky. All photos were taken in direct sunlight and without top coat. Elisa is a gorgeous metallic red with what appears to be small metallic red flakes. This polish glows from within! Now we have Song, a royal blue with the same small flakes as Elisa, just in blue. Another stunner! Next up is Ray. Ray is a metallic/frosty forest green. This one had a few brush strokes because of the finish but nothing major. It also has a lovely shimmer of gold or silver and green as well. Now for Suri, a gorgeous purple that is fit for royalty. This one has flakes of purple, blue and pink and shimmers so beautifully. Now for Daul, a gorgeous lilac with gold shimmer. There you have it. What are your thoughts on the Diva Collection? I love all of them although I must say the Designers Collection is my personal favorite. The Divas Collection is available for purchase now at zoya.com for $8 each. Zoya is an amazing company that runs sales and promotions very often. Make sure to catch those by following them on Facebook and Twitter. Zoya is 5-Free and Cruelty-Free AND makes amazing polish! What more could you ask for?